Cissie is a 17-year-old Dutch girl who managed to blag a meet and greet with Metallica, just before the band's performance at Pukkelpop festival in Belgium. A surprisingly courteous James Hetfield took a shine to the girl, and opened up about songwriting and his secret weapon for memorising would-be lyrics: the iPhone. Cissie shared the experience on YouTube with a note: "sorry for being a bit stupid, I was really nervous and it was quite hard to form sentences with the Mighty Het standing right in front of you". She's very modest, It's really not stupid. 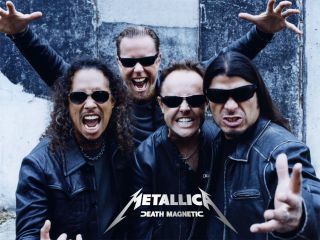 Here's what happened when Cissie met Metallica: "Most of the time when I'm writing a song, I'm not writing. Just goofing around, you know? ", said James Hetfield. "When I get a good guitar sound or when I feel good I put on the guitar and something comes up. If I tell myself 'ok, now I have to write', it doesn't flow. A lot of times when I'm sitting on the couch with an acoustic guitar and all of a sudden something will happen and it's 'uh oh, I have to go and record something'". Being a young guitarist and songwriter herself, Cissie wants lyric writing tips too: "I'll just see words that are interesting to me, and put them in my iPhone or something", said a laughing Hetfield. "Some words are strong - you see them first and then you hear what they mean. Or I'll hear other songs about a subject and I'll think 'I could write about that but in my own way'". "A couple of times I've sat and just wrote poetry - where things rhyme - and then try and put it into song. Sometimes it works, sometimes it doesn't". To see a monster of rock being all polite and nice to a young fan, watch the full video here.